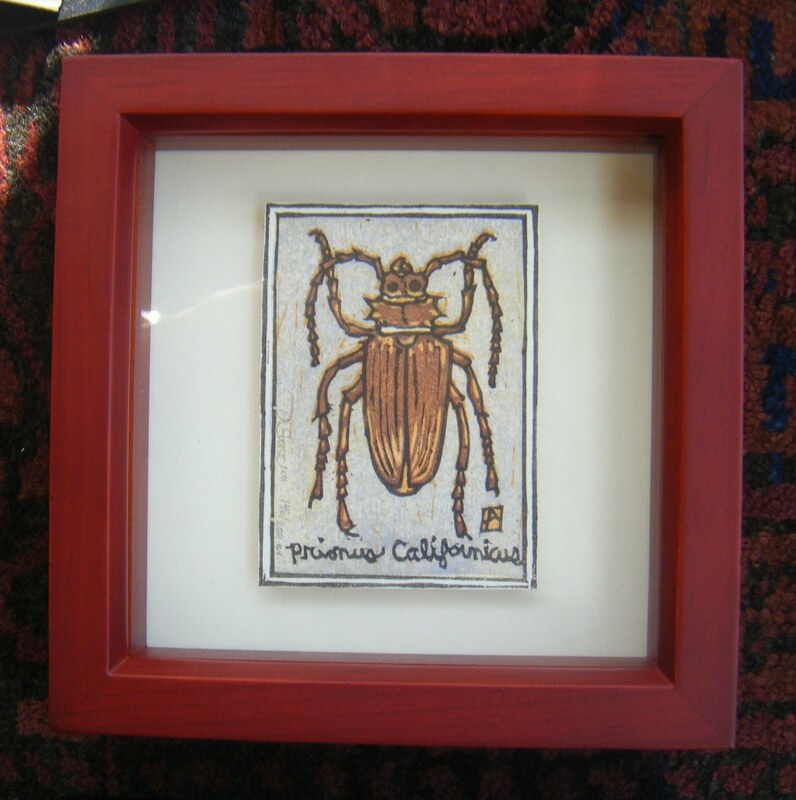 Cherry Root Borer Beetle, moku hanga color woodblock, 2.5x3.5", E.V. 200. Two of my most recent prints will be on view next week in San Francisco in the juried Botanical Art exhibit at Orangelands gallery in the Nob Hill district of San Francisco. The opening is next week; Thursday Sept 13th 5-7pm. Included in the show are the Maple branch print that so vexed me much of this Spring and the Beetle version of the parasitic, cherry, root-boring, longhorn beetle, Prionus Californicus. (He eats cherry so I guess that makes him "botanical"). I've decided to frame "Beetle" in a small shadow box and it looks great. He's been mounted onto a small piece of acid-free foam core so he sits up off the back mat and casts a bit of a shadow. I hope any Bay Area friends, printmakers or family can stop by during the opening to say hi or make it to the show later in the month.